Union with the National Trust for Historic Preservation, Dade Heritage Trust and Live Healthy Little launches long-term planning process to create a thriving, healthy and livable community. Miami’s Little Havana—a neighborhood that stands as a testament to the immigrant spirit that built America and a place that remains a dynamic, culturally rich, and affordable neighborhood—was today named a National Treasure by the National Trust for Historic Preservation. In partnership with Dade Heritage Trust, PlusUrbia Design, and Live Healthy Little Havana, the National Trust is today launching a long-term planning process that seeks to work with neighborhood residents, civic leaders, and local partners to ensure that Little Havana can remain a thriving, healthy and livable community that embraces its past while planning for a brighter future. Despite Little Havana’s significance and its continued role as a home to thousands of Miamians, the neighborhood currently faces a range of threats, including development pressure, demolition of historic buildings, displacement of existing residents, and zoning changes that could impact its affordability, cultural richness, and character. To address these threats, the Trust is launching a planning process to work with neighborhood residents and other stakeholders on solutions that encourage continued growth while preserving the neighborhood’s unique character. Blocks of modest older, smaller buildings in Little Havana have the same level of population density as the nearby towers of Brickell, but in Little Havana, these levels of population density are contained in historic, human-scale buildings. 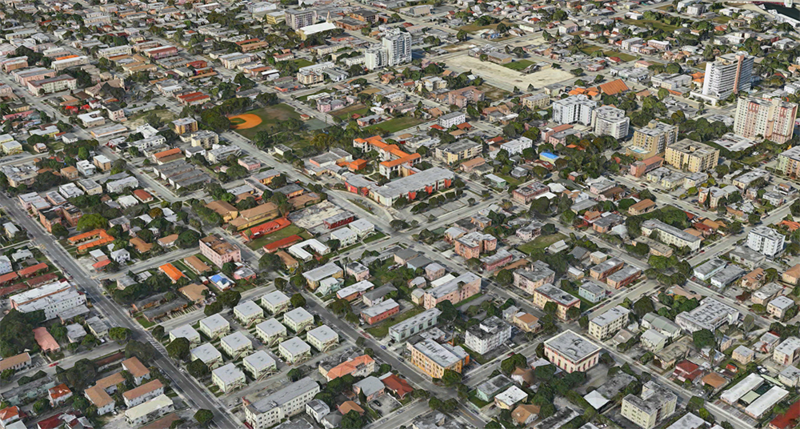 More than half of Miami’s 100 most densely populated city blocks are located in Little Havana. Miami’s greatest concentrations of rental housing in general and affordable rental housing in particular are found in Little Havana. Though Little Havana takes up about seven percent of Miami’s land area, it contains close to 20 percent of the city’s rental housing stock and more than a quarter of the city’s housing rented for less than $1,000 per month. 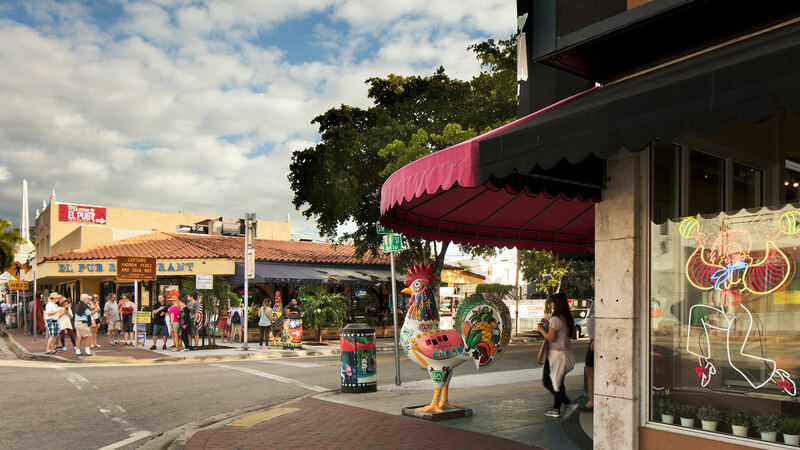 Little Havana is host to thousands of small businesses and hundreds of women and minority-owned businesses. The commercial corridors of Little Havana—Calle Ocho, 12th Avenue, Flagler, and others—have some of the city’s highest concentrations of such businesses. Little Havana’s story is at the heart of the American experience. From its earliest days as a streetcar suburb, to its iconic role as a haven for Cuban Americans, to its more recent role as a home to immigrants from Central America and the Caribbean, Little Havana has been shaped by people striving to build a better life for themselves and their families. To this day, visitors to the neighborhood can experience a thriving neighborhood that is truly one-of-a-kind. The neighborhood’s unique buildings—local variations of recognized types like the bungalow, center hallway walk-up apartments, and small commercial buildings housing mom-and-pop stores—have served generations of residents who have adapted them to fit their needs. The Trust’s research suggests that these character-rich historic buildings can play an essential role in the future growth of Little Havana. Dade Heritage Trust is a non-profit 501c3 organization founded in 1972. The mission of the organization is to preserve Miami-Dade County’s architectural, environmental and cultural heritage through education and advocacy. Dade Heritage Trust is funded through memberships, private contributions, grants and public programming proceeds. For more information, call Christine Rupp, Executive Director, at 305-358-9572 or visit dadeheritagetrust.org. Live Healthy Little Havana is an initiative coordinated by the City of Miami and supported by the Health Foundation of South Florida to promote healthier living in Little Havana. The goal is to strengthen community capacity to collaboratively plan and collectively carryout strategies to improve health. Residents and employees of Little Havana expressed concerns about the well-being of residents within the community at meetings and have identified health impact areas: physical activity, primary care, mental health & substance abuse and nutrition. LHLH has a focus placed on strategies that will foster changes in policy, systems, or the environment, with an emphasis on sustainability.